Optimizing HPC Applications with Intel® Cluster Tools takes the reader on a tour of the fast-growing area of high performance computing and the optimization of hybrid programs. These programs typically combine distributed memory and shared memory programming models and use the Message Passing Interface (MPI) and OpenMP for multi-threading to achieve the ultimate goal of high performance at low power consumption on enterprise-class workstations and compute clusters. 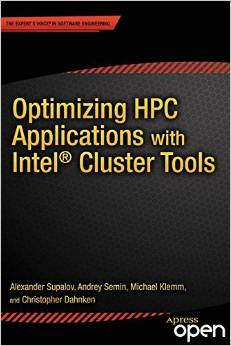 The book focuses on optimization for clusters consisting of the Intel® Xeon processor, but the optimization methodologies also apply to the Intel® Xeon Phi™ coprocessor and heterogeneous clusters mixing both architectures. Besides the tutorial and reference content, the authors address and refute many myths and misconceptions surrounding the topic. The text is augmented and enriched by descriptions of real-life situations. Privacy is important! When writing to this site, please encrypt your mail. Welcome to my realms on the web!